Personality section: Norway is a very aloof nation. Keeping to himself and carrying a air of mystery to himself. He is calm and quiet, rarely showing emotions outwardly. He struggles with expressing himself with certain things so finds it easier not to. 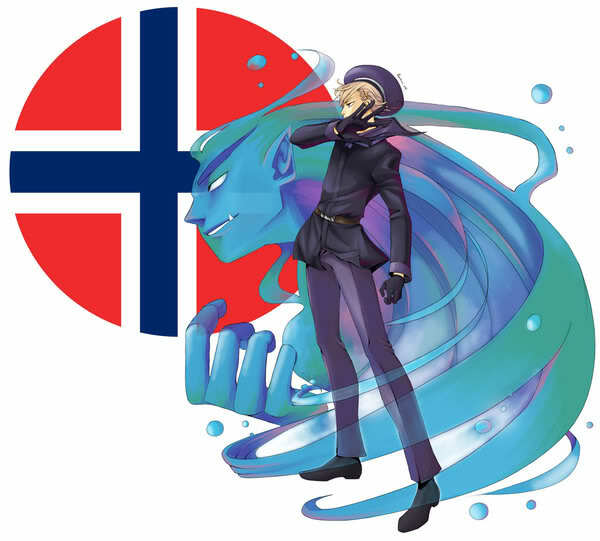 He's generally elusive sticking to the general Nordic nations though he sometimes ventures out to connect briefly with other nations like England over there love of the mystical. When forced to interact with others he is generally polite and when spoken to keeps straight to the point. The only exceptions to this ruling are Denmark and Iceland. Denmark gives Norway a wide range of emotions ranging from frustration, disgust and irritation. Though Norway is not shy to tell Denmark what he thinks it is often ignored by the more idiotic nation. Iceland on the other hand is his beloved brother. He adores the little nation and though he struggles to show it he has his own way of letting the nation know. He is never happier then when the snowy haired boy calls him big brother. Roleplay sample: The fire was warm as it crackled over the wood he had gathered just that morning. It's warm glow reaching out over the front room with caresses against there skin. Leaning back against the plush cushions of his sofa Norway watched the flames dance in a heated tango as Iceland slept in his lap the blanket draped over the younger's frame. The slight sparkle of his nisse as she floated round his head before she dropped onto his shoulder nuzzling into the collar of his shirt dozing in the sleepy afternoon. A ghost of affection fell over Norway's eyes as his fingers brushed through the snowy locks of his brother. The slight blush of his brother's fever had subsided for now and had joined him and the other Nords for dinner. Now it was just the two of them in his quiet home and Norway would have it no other way. A soft prod to the younger's cheek while he dreamed caused the younger to frown in his sleep and mumble. He smiled and prodded while mouthing 'Onii-chan' Quietly as not to wake the other. He couldn't help but feel warm sensation in his soul as he remembered the good old times when the other was so little. Leaning back he let his eyes drift shut as he drifted into his own dreams. Back when the Nords were feared. Anything Else? : Grey...yeah its not really a colour but a beautiful quote from king of hell made me love this...if you really want a colour then.....um I guess blue?? Of course, you're accepted~ Feel free to post an introduction for yourself in the Introduction board, then you can get started working on your profiles for the AUs!